Making a raspberry wheat ale on a chilly May Sunday. Had a fire going in the backyard, but then had to pull out the umbrella when the rains came. It will all be worth it in six weeks when the beer is ready and cold and the summer is hot. I'm trying to grow three varieties of hops this year, inspired by my wife's bountiful garden. 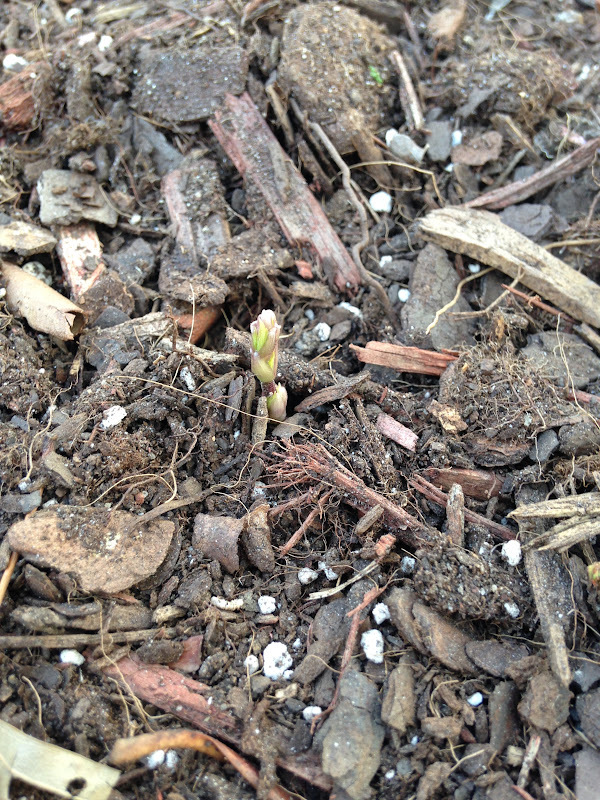 Here's the first sprout of a Centennial rhizome to poke through the earth. I've been overdue to brew a Kölsch I've been planning for the spring. Despite a constant drizzle all morning, I set up under the eaves of the garage and got to work, with the help of my brother-in-law, an engineer and accomplished homebrewer in his own right. Even though he has a technical background, his best advice for homebrewing is to not get too technical about it. With a little patience, any minor missteps in the brewing process will work themselves out in the fermenter, he says. An acolyte of Charlie Papazian, my brother-in-law's mantra is to relax and have a homebrew. That was all the excuse we needed to drink a beer while we wee making it. Luckily, we still have some of the chocolate milk stout left to enjoy. Except for a slight boil-over after we added the Tradition hops to the boil, it was an uneventful brew, until it came time to rack the beer to the carboy. For years, I've used an immersion chiller to cool boiled wort. But my brother-in-law brought along his plate chiller to this brew day, and it was amazing. The plate chiller brings down the temperature of your wort while it's draining into the fermenter, cutting a good half-hour off the brew day, at least. Suffice it to say that I'll be looking to pick one of my own up soon enough. After one of my fastest brew days in years, I now have five gallons of Kölsch fermenting in my beer cellar. I'm looking forward to tapping a keg of it in six weeks. And I'll probably have to share a bottle with my brother-in-law, to thank him for introducing me to his plate chliler. Gravity (and a garage) can be a brewer's best helper while making an Irish Red Ale on a snowy day. Digging out just enough to brew a chocolate milk stout. 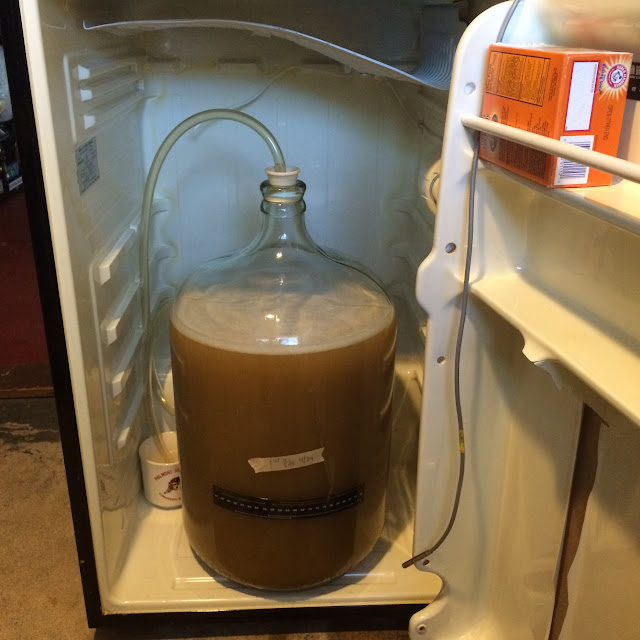 Shortly after I began kegging my beer instead of bottling, I realized that I was going to want a kegerator. But it wasn't until I saw the one that my friend John built that I got inspired to try to make one myself. It started in December of 2014, when I found a good Black Friday deal on this 9.05 cubic foot Frigidaire chest freezer. I managed to just barely fit it into the side door of my house and down the stairs to my basement, with barely a millimeter to spare. I knew I wanted to follow the steps for converting a freezer to a kegerator laid out by the good folks at Northern Brewer. Still, it took a few months for me to get around to the project. When my father-in-law, who is an exceptionally handy craftsman, was visiting last winter, we finally took a crack at it. Here are a few photos documenting the process. We first unscrewed the lid from the freezer and built a rectangular wooden collar out of 2-by-6 boards. We carefully drilled three holes in the front of the collar. This allowed us to put the beer shanks for the taps through the wood so we wouldn't have to drill through the lid for a tower. Then, we carefully glued the the collar to the rim of the freezer, using an epoxy suitable for all-weather use. To get the glue to set, we put the lid back on and piled a lot of heavy items on top of it overnight. Once the glue set, I sealed all the corners with silicone. Then, it was time to stain the wood and varnish it. I put down three coats of varnish over several days. One unpleasant side effect was it made the basement stink of varnish, so we kept the children upstairs for a while. After the varnish dried, I screwed the lid back onto the collar, installed the taps and connected all the tubing. It has room for a 5-lb CO2 canister and at least three, 5-gallon ball lock kegs. (I think it might actually fit a fourth keg. When I get one, if it fits, it will be easy to add a fourth tap. I ran some line cleaner through the taps and rinsed them with a few gallons of water. After one small mishap, I had no problems dispensing beer over the summer. And that's where I left it. But the white lid that came with the freezer never did a lot for me, especially after I managed to dent it a bit when I was rolling it down my basement stairs. So over the Christmas holidays, with my father-in-law once again in town, we went back to make the finishing touch, a proper wooden lid. We nailed three 1-by-4 wooden boards to a pre-cut piece of half-inch plywood. It fit perfectly over the stock freezer lid. We stained and varnished the cover and then glued it down. It took 13 months from start to finish to build my perfect kegerator. Of that time, there was maybe 2 days of work with another 3 or 4 days in between for glue, silicone, stain and varnish to dry. Now that it's done, it's time to get back to the important job of filling it with homebrew beer. After brewing one or two batches a year for the past few years, this should be quite a ramp-up. Pray for me.